So I love my Wii Fit, even though it gives me bad news daily, insults my friends, and reminds me that it (nor I) has seen my sister in two months. Tony and I both set goals and hope to be near reaching it before we go to Milligan for homecoming. Although I'm making decent progress, I will be nowhere near my goal then. I don't like that my little "Mii" has turned pudgy to match what the Wii thinks of my BMI. It has fun exercises, one of which is NOT doing lunges. I have always hated them ever since high school when Cindy Crawford used to make me do them in her annoyingly peppy voice. 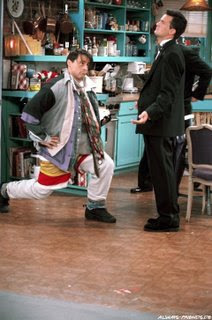 Now I at least get a slight kick out of picturing my favorite "Lunges" reference.